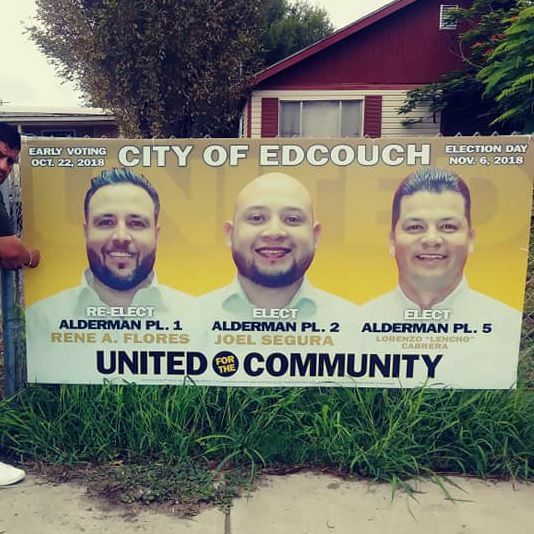 Alderman Joel Flores’ prediction that voters in Edcouch wanted drastic change was right. The United for the Community slate, composed of Flores along with Joel Segura and Lorenzo “Lencho” Cabrera, came out ahead of the sole opposing slate. Flores received about 63 percent of the vote, 801 votes, according to Hidalgo County Elections Department election results released Tuesday night. Interim City Manager Eddy Gonzalez, who sought to unseat Flores, one of Gonzalez’s bosses on the board of alderman, received about 37 percent of the vote, 473 votes. Gonzalez, a former alderman, pleaded guilty to tampering with a government record in 2016. The new slate could likely spur changes at city hall, including who will take the reins as city manager. Segura came ahead in the tally, ousting Alderwoman Esmeralda Cabrera from her seat on the board. Segura received 61 percent of the vote, 774 votes. Cabrera garnered 39 percent with 491 votes. Voters also elected Lorenzo “Lencho” Cabrera, Esmeralda’s cousin. About 64 percent of voters cast ballots for him, 818 votes total, compared to his opponent Ruth Ruiz’s 451 votes, or 36 percent of the vote.